Above: The most commonly requested wood choices for our custom-made furniture. Other wood types can be obtained. Please call us with your requests. 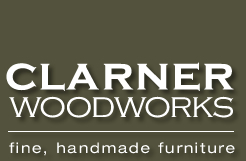 Clarner Woodworks uses a variety of wood types when custom-making its handcrafted solid wood furniture. The unique grain pattern of Curly Maple, also known as Tiger Maple, offers beautiful configurations which makes it an ideal choice for decorative purposes. This wood is also strong, heavy and hard. Birdseye Maple wood is strong and hard like regular maple, but has an intricate pattern in the grain that resembles birds eyes. This pattern is quite rare and unique -- no two pieces of birdseye maple are the same. Cypress wood has been valued throughout the ages for a variey of purposes, in part due to a natural perservative found in its wood which makes it particularly durable. This dense wood is moderately heavy and finishes well. Its resistance to decay rendered it ideal for constructing vats, and it is the source of our Reclaimed Rheingold Vat Wood. Indigenous to the Pacific coast of the United States, redwood trees can grow to be as tall as 300 feet and as old as 2,500 years. Redwood is durable and light, has a natural reddish color and is resistant to deterioration from sunlight and moisture. Our use of Old Growth Redwood is environmentally friendly -- we use reclaimed (recycled) wood only, like our Rheingold Vat Wood collection of reclaimed redwood and cypress. This hardwood proudly displays its Vermont heritage! Obtained from Sugar Maple trees, Tap Maple wood has a spiked pattern which is the result of tapping the tree multiple times over the years for maple syrup sap. Aside from being decorative, Tap Maple is strong, hard, heavy, and resistant to shock and abrasion. Reddish brown in color, the unique figure of Curly Cherry wood makes it a highly decorative choice for furniture. It is close-grained, strong and moderately hard. This type of Mahogany is highly desirable for its distinctive figure, which resembles swirling ribbons. Like all Mahogany, is it strong and resists swelling and warping. It is unique and highly decorative. Oak wood is strong, durable, and resistant to moisture. It is a heavy wood and finishes well. Because of its hardness, oak can be difficult to carve. Yellow Birch wood has a uniform, fine grain pattern and a creamy yellow color which delivers a light clean look. It is moderately heavy, strong and hard. The interior wood, or heart wood, of the Yellow Birch tree is called Red Birch. This highly desirable heart wood of the Yellow Birch tree is as uniform and fine grained as Yellow Birch Wood, yet it's color is a distinctive reddish-brown. Since the width of the heart wood can vary enormously, furniture from Red Birch heart wood boards is more rare than Yellow Birch wood furniture. Red Birch is moderately heavy, strong and hard. One of the most lovely and desirable forms of Birch, Flame Birch wood has distinctive figure in the wood that resembles tounges of flame. It is highly decorative, with a creamy yellow color that has a unique luster. Like all Birch, it is moderately heavy. It is also stong, hard, and durable. This moderately hard and heavy wood is native to Southwestern Oregon/ Northern California, the only area in the United States with growing conditions suitable for this species. Many grain patterns appear in Myrtle, including burls, tiger-stripe, fiddleback, quilt, inkline, and flame grain. Myrtle wood polishes to a very high luster. Reclaimed wood, or recycled wood, is not only an environmentally-friendly choice, but it can also be more attractive and more durable than new wood. The coloring and rich texture of well-worn reclaimed wood can be highly desirable, and because a lot of reclaimed wood comes from old-growth trees, the wood itself can be denser and more durable, rendering any furniture made with reclaimed wood likely to endure even longer. Clarner Woodworks has obtained a limited supply of Rheingold Vat Wood, a collection of reclaimed old growth cypress and redwood that was once beer vats at the Rheingold Brewery in Brooklyn, NY. This tight-grained cypress and redwood dates to the late 1800's and is an extremely attractive wood. The historically-rich source of this wood and its limited supply make Rheingold Vat Wood a unique and highly desirable choice for furniture-making.